The Museum of Modern Art in New York will become a test bed for artists, curators, critics and experts looking to find the museum of the future. “My goal is to finish this project and then to see it as a platform for a whole new level of activity on the part of the museum. Building projects are not an end unto themselves. 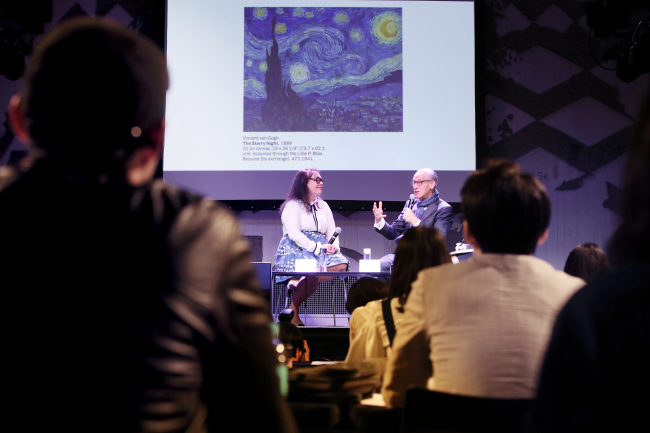 They are means of beginning a new chapter in the life of the institution,” said MoMa Director Glenn Lowry during an interview with The Korea Herald at Hyundai Card Understage in Itaewon, Seoul, Tuesday. Lowry emphasized that museums can no longer follow traditional notions of a museum as a treasure house or repository for the past. “The idea of recuperating the notion of a museum as a work in progress seems essential to our goals,” he said. The museum’s upcoming expansion, designed by design studio Diller Scofidio + Renfro in collaboration with Gensler, will offer additional gallery space of some 3,700-4,600 square meters. The remodeling of the museum starts June 15 with the reopening slated for Oct. 21. One of the things that will happen in the new space is more regular rotations -- about every six months -- of works in the collection, said curator Sara Suzuki at a press conference to introduce the MoMA expansion held earlier in the day. The aim is to show the institution’s already well-known works of art with those that are kept in its storage, which are “often much more adventuresome and much more eclectic,” according to Lowry. The change that the MoMA is embracing is not new in the global art scene, Lowry admitted. It’s more about the museum recovering its essence, he added. “We want someone to come to the Museum of Modern Art who thinks … they are coming to see Van Gogh’s ‘Starry Night’ (for instance), but leave excited about Yang Hae-gue,” Lowry said. A media installation work by Korean artist Yang -- the recipient of the 2018 Wolfgang Hahn Prize -- will be shown at the MoMA’s new space when it reopens on Oct. 21. The longtime director also laid out the new studio space and its research platform Contemporary and Modern Art Perspectives as among the efforts to bring diversity to museum settings. The studio space can accommodate various performances and activities on a regular basis. The museum’s goal with the space is for performance to become embedded in the flow of the museum’s galleries. “If you think about many performance spaces, they are often separated from where the collection is shown. We wanted to see performance as integral to the way in which you experience collection,” the director said. C-MAP is a research-driven, cross-departmental, in-house research program at the MoMA, which invites experts from various backgrounds to discuss and research issues.